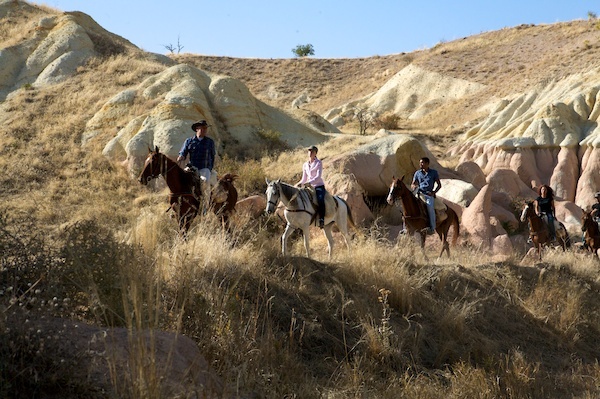 Journey back in time on horseback through Cappadocia on a village to village horse trek with the locals. In ancient times the name Cappadocia meant “the land of beautiful horses” and the finest horses were raised in this part of Central Turkey. 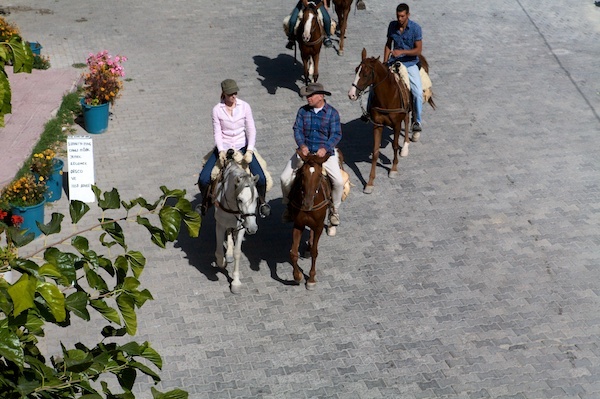 As part of my job as the host of the PBS series Equitrekking, I travel the world riding horses with local people. At lot of times, I see a place once, but don’t have the opportunity to go back. I made it a point to venture back to Cappadocia for a second time to ride their strong Barb-Arab horses because I had to see more. I was fascinated by the people who lived a traditional, subsistence lifestyle in the old rock cut houses in historic villages like Güzelyurt and Cavusin. I was intoxicated by the strong, piping hot tea, served in small glass cups, which at first burnt my fingers and at once drew me in. The food burst with flavor—fresh, red tomatoes, creamy feta cheese, tart homemade jams and simple, hearty soups. I was amazed that I could ride a horse from one village to the next on my Cappadocia riding vacation, getting lost amid the whites, pinks and browns of the bizarre rock formations, called fairy chimneys, which rise up in the shape of towers and undulate like ocean waves, looking altogether different depending on your location. My local guide and now friend, Ahmet Diler, a horse guide, rug trader, hotelier, tour operator and entrepreneur grew up in Avanos, the old pottery center, where we based ourselves. 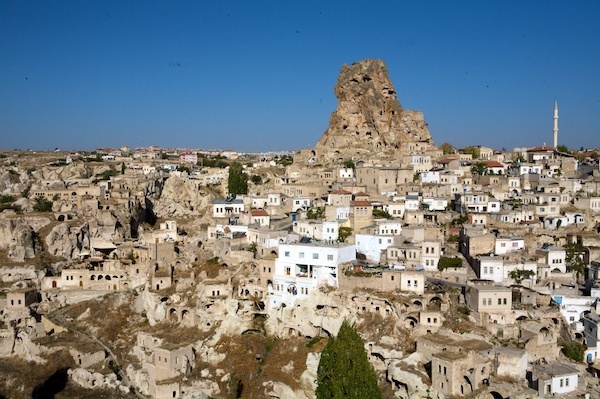 Not only does Ahmet know everyone, his passion for Turkey’s history had endeared me to Cappadocia on my first visit and was once again, as we took off at a canter towards the old Greek city of Mustafapasa. Meandering among the lunar landscapes of the Üzengi Valley, I could easily imagine what life was like here hundreds of years ago, because things here haven’t changed so much. Earlier in the day, Ahmet had taken me to meet an elderly neighbour who was working in her yard on her annual winter preparations, stirring a giant metal vat of some thick, sweet, smoky substance. 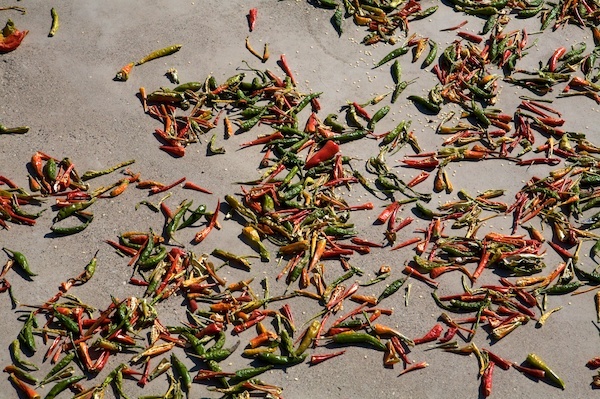 Colorful green and red peppers and grapes turned to rainsons lay drying on the roof of her shed. On the patio, above me grapes hung down from wooden terracing. She was making pekmez, a thick molasses colored sweetener traditionally prepared in villages around Cappadocia after the fall grape harvest. I had eaten pekmez for breakfast that morning. A key ingredient to the pekmez made in the village of Avanos is special volcanic soil added during the initial boiling process. By itself, the thick jam did taste a little earthy to me, but when put atop hot bread from the village’s communal oven with a thick slice of feta cheese, it was a really good combination. Ahmet asked the woman and her husband to show us the process. At once, the tiny, plumb grandmother cut down a bundle of grapes from her patio and placed the bunch into a concrete tub. Lifting her light pants, she crushed them to bits with her bare feet- think I Love Lucy’s “Grape Stomping” episode. She smiled as the sticky juice drained down a pipe into a white bucket. The juice was then taken to her metal cauldron, sitting over an open fire in her backyard. She and her husband added the special soil to thicken the bubbling grape juice, which was then cooled and strained through a bag. The liquid was then put back in the pot and boiled and stirred for many hours until it was ready to cool and jar. Already on our ride today, we’d seen a few other villagers making pekmez. Now out of the village and passing through Üzengi Valley, our horses clip clopped through streams and over rocky passes. 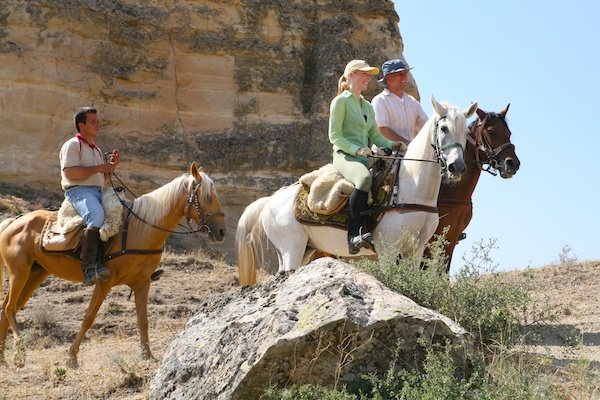 Our horses took the sometimes challenging rocky terrain with stride, much more surefooted than I would have been through narrow valleys of fairy chimneys. We passed a few hikers, some of whom had traveled from far away to reach the mineral waters, which lay ahead and Ahmet explained are reputed to have some medicinal properties. 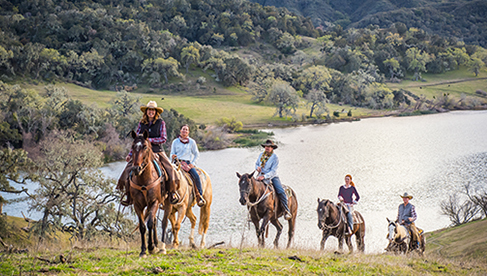 I was glad to be on horseback once again, as I saw locals and a few Japanese tourists rolling up their pants and wading along in their shoes. 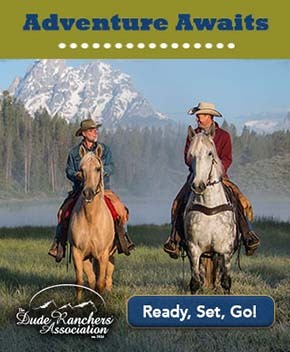 Everywhere I travel I ride diverse horse breeds, whose tack is also different. 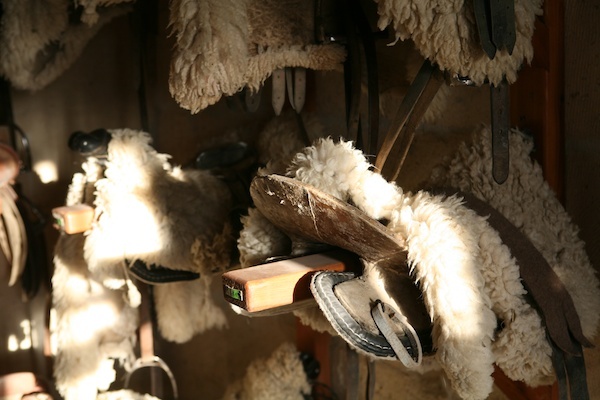 Here in Turkey, I was riding on soft sheepskin covered saddles Ahmet had acquired in Kyrgyzstan. These saddles are similar to an American Western saddle in that they have a horn that sticks up in the front, the kind cowboys might use to rope a steer, but the Kyrgyz saddles have a taller tree, so you sit higher off the horses’ back. I had to get used to sitting so high, as that meant I had less contact with my horse’s sides. As a primarily English style rider, I use my reins and legs to communicate with my horse. It was a good thing Incion, the 9-year-old white steed I was riding, was both well trained and kind, allowing me to make a few mistakes in leading as we traveled. Riding along towards Mustafpasa, we stopped several times to examine something new. 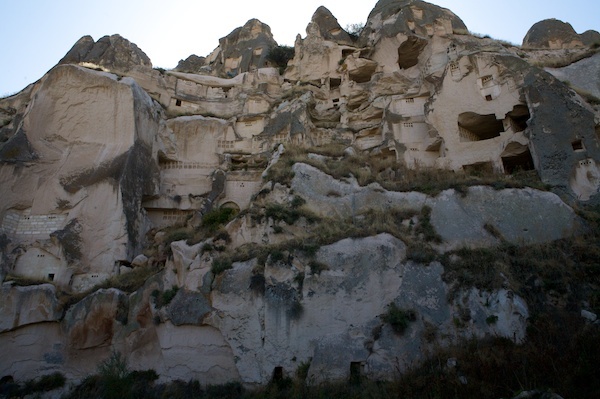 Ahmet pointed out a series of cubbyholes carved high into the cliffs above called dovecotes. These pigeon houses were usually carved near a water source, like the nearby natural springs. They were meant to attract pigeons to nest. Locals would and still do collect the droppings and use them as fertilizer for their vineyards and crops. We passed small pockets of vineyards, definitely best accessed on horse or donkey. 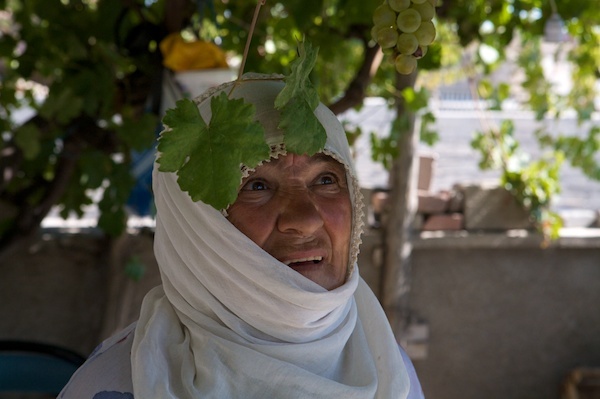 Many people in Cappadocia make their own wine from their small vineyard, not surprising in an area where “homemade” is normal. We stopped at the spring and our small group filled water bottles for the duration of the ride. By the late afternoon, we had reached the old Greek village of Mustafapasa with its stone houses with carved facades, rock-cut churches and Ottoman style architecture. The village dates back to Byzantine times, and much like it was then, the people here are mostly self-sustainable. They farm and trade as they have for hundreds of years. 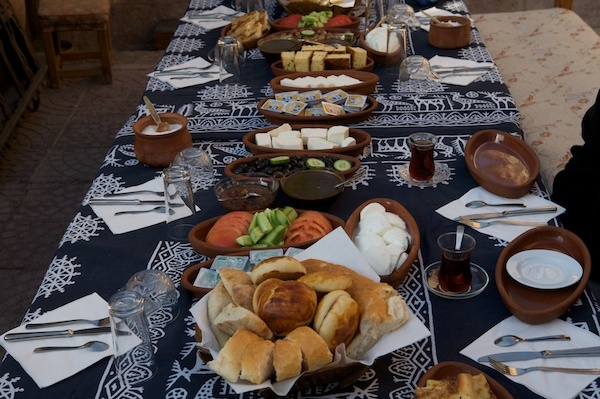 During Ottoman times Mustafapasa was a rich center for the caviar trade, and was called Sinasos up until the early 20th Century, when it was inhabited predominantly by Greeks. 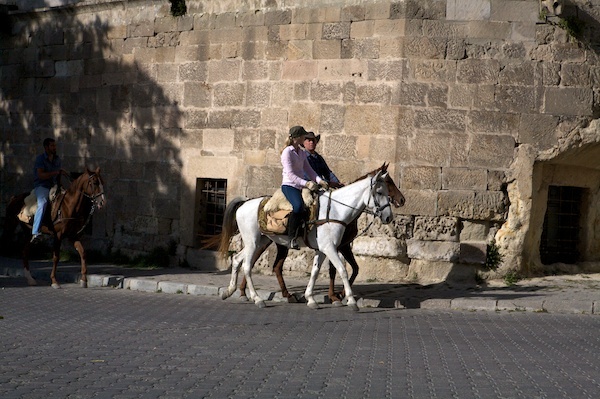 Unlike some of the more popular villages in Cappadocia, Mustafapasa is not on the typical tourist itinerary and unlike typical tourists, we entered the village from above, sliding a bit as our horses took on the sometimes steep cobblestone streets. 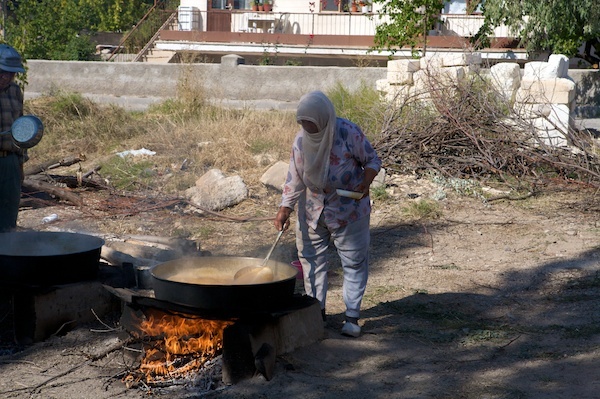 As we reached the center of town, I passed a group of older woman stirring pekmez. While the older village women were dressed in traditional colorful dresses and headscarves, the younger generation was outfitted in jeans and t-shirts. I wondered out loud how much longer people would be able to see these traditional ways, even in an authentic village like Mustafapasa, if the younger generation didn’t take an interest. Ahmet said that many younger villagers were moving to the cities. While many didn’t come back, others, finding that city life was too hard to find, did move back. Ahmet was adamant that everything the people needed to survive was around the village. They may have to farm wheat or fruit, restore each other’s homes or serve in a local restaurant, but there was enough to keep the village going, if the young people wanted to stay and take the reins. As I starred at young teenaged boy, who looked like he could have been straight out of New York City, I wondered if he would one day help his wife make pekmez. Change was coming to Cappadocia and I was glad I got to ride its past before it did. Take this riding vacation to explore Cappadocia, Turkey through EquitrekkingTravel.com.